Jennifer and Issa Williams are dressed to go to Homecoming; Lynn, Anissa, and Jefferson are taking photos. Khalil arrives and he darts everyone. Jennifer and Khalil fight throughout the house; she energy blasts him out of the window. The fight was a hallucination in the dream world. Perenna is teaching Jennifer to rein in her energy and place it in the box, but good memories of Khalil causes it to react. Deputy Chief Henderson interrogates Tobias about the crimes and the murders. He has 48 hours to find evidence against him or Tobias walks from the station. Peter shows the video of Anissa stealing money from the mobsters to Jefferson. Anissa and Jefferson argue about their superhero responsibilities; Anissa plans to move out because of their fight. Jenn is sad that Anissa is packing and moving out. Khalil texts Jenn and Anissa tells her to stay away from him. Lynn is worried that they may have neglected Anissa. She has come to terms about shooting someone. Henderson tells Jefferson that they don't have the evidence to put Tobias away. Jefferson is willing to come clean about seeing Tobias kill his father as a child. Kara is awake but she's tied to a stretcher in Peter's lab. She has sepsis and he urges her to come clean; Kara refuses. Jefferson breaks up a fight in the school hallway and gets the two boys to make amends. Principal Lowry arrives to expel the boy who threw the first punch and suspend the other boy. He disrespects Jefferson and tells him he can leave if he doesn't like it. Jefferson tries to get Principal Lowry to reconsider, but he doesn't relent. Anissa crashes at Peter's place. Dr. Jace performs an experiment without Lynn's prior knowledge. One of the pod people exhibits their ice powers and dies in the process. Jenn is made at Jennifer and continues to ignore him. One of the mobsters asks Tobias for permission in killing the woman who stole money from him. 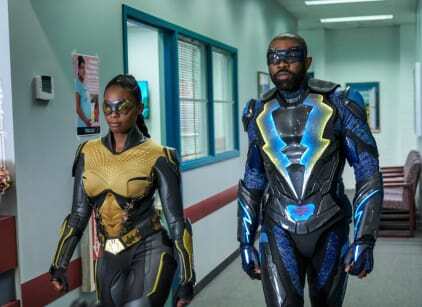 Tobias grants permission, but only if they place face and body recognition sensors outside the clinic in case Black Lightning and Thunder show up. Jennifer receives an email from Khalil, which causes her powers to fry her laptop. Jefferson plans to take back his school from Principal Lowry. Anissa arrives home and asks her father for help in protecting the free clinic. They make a shaky apology. Anissa, Jefferson, and Peter think the attack on the clinic will be a blast caused by someone walking through the front door. Dr. Jace planned for the experiment to fail; she's doing an autopsy on the dead body. She reviews the metahuman samples in the system and hypothesizes that there is a family of metahumans running around Freeland. A woman delivers a bomb to the free clinic; Peter confronts her outside and the pair fight. Black Lightning and Thunder stop the bombs from exploding. The woman steals a motorcycle and flees. Ms. Montez performs a mock witness questionings with Jefferson; she can't put him on the stand because he's an unrealiable witness. Lynn and Jefferson decide to homeschool Jennifer. Kara tries to shoot Peter, but she fails. She gives Peter a phone and begs to be cremated; Kara dies from her wounds. Tobias is freed from the police station. Jennifer meets with Khalil at the high school. Tobias reclaims his place at Club 100.